Frank the '66 Deluxe project. I managed to get my hands on a fairly decent 1966 Deluxe. My kids have called him Kirby, but since I'm the one doing the bulk of the work, I'm calling him Frank! The intention is not to do a full restoration, but to do a period sympathetic body off rebuild with modern updates for safety. Main updates are the front seats, and the wheels. Putting in a pair of BMW E36 coupe seats, and rebanding the wide 5's to 15x6 with staggered offsets to keep the tires inside the guards. Engine is a 1300SP that runs but with low compression, so will get a rebuild along the way. 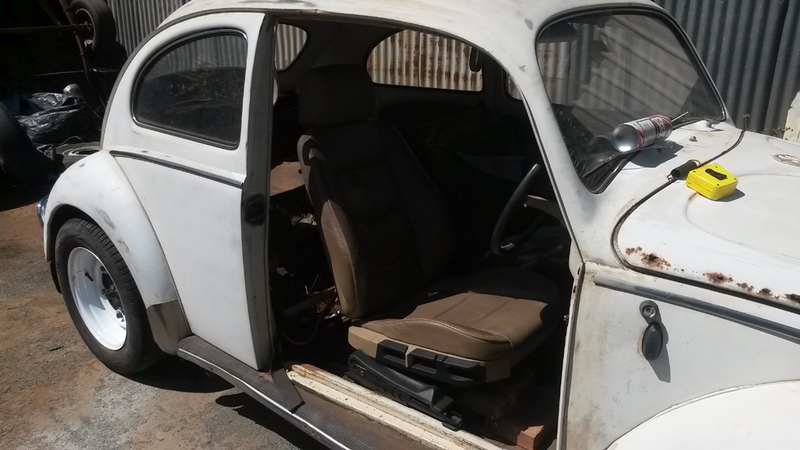 Minimal rust, just in the rear of both front wheel arches and bottom door hinges, along with a few other repairs, which is to be expected in a 50 year old car! I'll upload pics as I go, but here are some to get started with. And yes, I'm planning this to be at least a 3 year build. 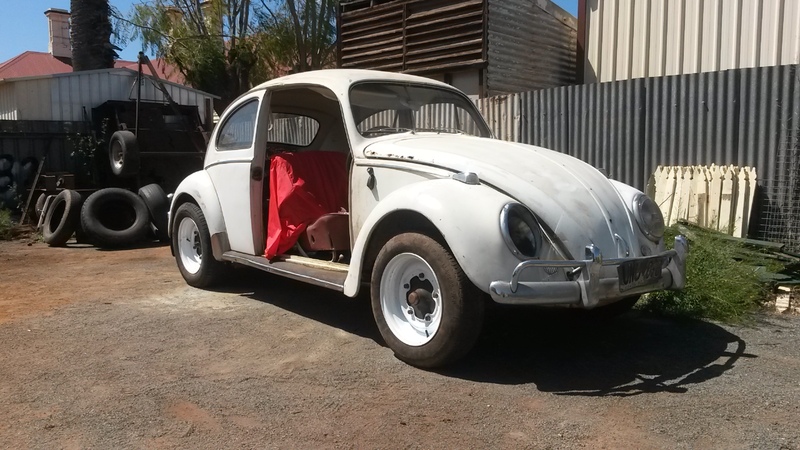 Welcome to the VW restoration world.The 66 with 1300 is my all time favourite.Will look forward to see how you attack it. I've just uploaded pictures to my Imgur account. Feel free to check them out. Looking good- did you machine the centres from the rims? Manually with a 5" grinder and 1mm cutting discs, working very carefully. Took about 4 hours per rim to dissect both and combine the wide 5 centres and 6" wide bands. It's back on the ground now, and I started messing around with fitting the BMW E36 coupe seats. Real easy to make the mounts, and I'll be able to fold up a drawer for under each seat, on ball bearing runners, for a bit of extra storage. And there is just as much, if not more room to access the back seat than the original seats. have you had them balanced yet? Heard they are buggers to get done. Was going to use the Dynamic Beads for balancing. Unless I machine up an adapter plate at work. I have a bit of a technical question. With my seat runners, I've tacked up a quick frame to get my heights and placement sorted. As you can see, I've run my frames across the seats, with the intention of folding up some drawers for under the seats. Would it be better to have my frames running with the direction of the seat runners, with flat bar running across the seat to join the two halves? This way should give me more height for the drawer, I think. Did a sketch today which should make a bit more sense!! Got some more done tonight. Getting the seat mounts fabricated. Whoops! Meet Pig, the parts pig. Fibreglass wide guards and whale tail engine lid, jellybean mags and a healthy 1600 dual port. Some bits will be for sale. Just got Pig started up before it gets taken apart! Progress on Pig the parts car. Once Pig is stripped and gone, Frank will start getting some love! Floor plan of Pig. It was toast. Nice looking seats, are you going to re-cover them? Bit of an upgrade eh! Yes, going to get redone in brick red cloth to match the vinyl door cards. Vinyl seats in Kalgoorlie is not a great idea!! Guard removal and rust discovery on Frank. Rear clip almost off and glass out. Frank almost ready to split body from pan. Stripping the doors for Frank. Nice to have spares! What did you do wit the original seats from Frank? Frank's passenger door needs love. Sold them to somebody in Adelaide. The welding has started! It's all getting real now!